Peace Corps Online: July 27, 2004: Headlines: Election2004 - Kerry: Yahoo News: Teresa Heinz Kerry addresses the Democratic National Convention: "To me, one of the best faces America has ever projected is the face of a Peace Corps volunteer." 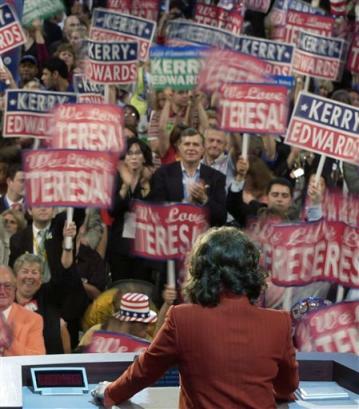 July 27, 2004: Headlines: Election2004 - Kerry: Yahoo News: Teresa Heinz Kerry addresses the Democratic National Convention: "To me, one of the best faces America has ever projected is the face of a Peace Corps volunteer." Peace Corps Online: Peace Corps News: Special Reports: Teresa Heinz Kerry comments on Peace Corps Volunteers: July 27, 2004: Headlines: Election2004 - Kerry: Yahoo News: Teresa Heinz Kerry addresses the Democratic National Convention: "To me, one of the best faces America has ever projected is the face of a Peace Corps volunteer." Teresa Heinz Kerry addresses the Democratic National Convention: "To me, one of the best faces America has ever projected is the face of a Peace Corps volunteer." Thank you, Christopher. Your father would be proud of you and your brothers. I love you and all our family. My name is Teresa Heinz Kerry. And by now I hope it will come as no surprise to anyone that I have something to say. And tonight, as I have done throughout this campaign I would like to speak to you from my heart. Y a todos los Hispanos, los Latinos; a tous les Americains, Francais et Canadiens; a tutti Italiani; a toda a familia Portugesa e Brazileria; to all my continental African family living in this country, and to all new Americans: I invite you to join our conversation, and together with us work towards the noblest purpose of all: a free, good, and democratic society. I am grateful for the opportunity to stand before you and say a few words about my husband, John Kerry (news - web sites), and why I firmly believe he should be the next president of the United States. This is such a powerful moment for me. Like many other Americans, like many of you, and like even more of your parents and grandparents, I was not born in this country. As you have seen, I grew up in East Africa, in Mozambique, in a land that was then under a dictatorship. My father, a wonderful, caring man who practiced medicine for 43 years, and taught me how to understand disease and wellness, only got the right to vote for the first time when he was 71 years old. That's what happens in dictatorships. As a young woman, I attended Witwatersrand University in Johannesburg, South Africa, which was then not segregated. But I witnessed the weight of apartheid everywhere around me. And so, with my fellow students we marched against its extension into higher education. This was the late 50s, the dawn of the civil rights marches in America. As history records, our efforts in South Africa failed and the Higher Education Apartheid Act was passed. Apartheid tightened its ugly grip, the Sharpsville riots followed, and a short while later Nelson Mandela was arrested and sent to Robin Island. I learned something then, and I believe it still. There is a value in taking a stand whether or not anyone may be noticing and whether or not it is a risky thing to do. And if even those who are in danger can raise their lonely voices, isn't more required of all of us, in this land where liberty had her birth? I have a very personal feeling about how special America is, and I know how precious freedom is. It is a sacred gift, sanctified by those who have lived it and those who have died defending it. My right to speak my mind, to have a voice, to be what some have called "opinionated," is a right I deeply and profoundly cherish. My only hope is that, one day soon, women � who have all earned the right to their opinions � instead of being labeled opinionated, will be called smart or well-informed, just as men are. Tonight I want to remember my mother's warmth, generosity, wisdom, and hopefulness, and thank her for all the sacrifices she made on our behalf, like so many other mothers. This evening, I want to acknowledge and honor the women of this world, whose wise voices for much too long have been excluded and discounted. It is time for the world to hear women's voices, in full and at last. In the past year, I have been privileged to meet with Americans all across this land. They voiced many different concerns, but one they all seemed to share was about America's role in the world � what we want this great country of ours to stand for. To me, one of the best faces America has ever projected is the face of a Peace Corps volunteer. That face symbolizes this country: young, curious, brimming with idealism and hope � and a real, honest compassion. Those young people convey an idea of America that is all about � heart and creativity, generosity and confidence, a practical, can-do sense and a big, big smile. For many generations of people around the globe, that is what America has represented. A symbol of hope, a beacon brightly lit by the optimism of its people � people coming from all over the world. Americans believed they could know all there is to know, build all there is to build, break down any barrier, tear down any wall. We sent men to the moon, and when that was not far enough, we sent Galileo to Jupiter, we sent Cassini to Saturn, and Hubble to touch the very edges of the universe at the very dawn of time. Americans showed the world what can happen when people believe in amazing possibilities. And, that, for me, is the spirit of America � the America you and I are working for in this election. It is the America that people all across this nation want to restore � from Iowa to California, from Florida to Michigan, from Washington State to my home state of Pennsylvania. It is the America the world wants to see, shining, hopeful, and bright once again. And that is the America that my husband John Kerry wants to lead. John believes in a bright future. He believes we can, and we will, invent the technologies, new materials, and conservation methods of the future. He believes that alternative fuels will guarantee that not only will no American boy or girl go to war because of our dependence on foreign oil, but also that our economy will forever become independent of this need. We can, and we will, create good, competitive, and sustainable jobs while still protecting the air we breathe, the water we drink, and the health of our children, because good environmental policy is good economics. John believes that we can, and we will, give every family and every child access to affordable health care, a good education, and the tools to become self-reliant. John Kerry believes we must, and we should, recognize the immense value of the caregivers in our country � those women and men who nurture and care for children, for elderly parents, for family members in need. These are the people who build and support our most valuable assets � our families. Isn't it time we began working to give parents more opportunity to be with their children, and to afford to have a family life? With John Kerry as president, we can, and we will, protect our nation's security without sacrificing our civil liberties. In short, John believes we can, and we must, lead in the world � as America, unique among nations, always should � by showing the face, not of our fears, but of our hopes. John is a fighter. He earned his medals the old-fashioned way, by putting his life on the line for his country. No one will defend this nation more vigorously than he will � and he will always be first in the line of fire. But he also knows the importance of getting it right. For him, the names of too many friends inscribed in the cold stone of the Vietnam Memorial testify to the awful toll exacted by leaders who mistake stubbornness for strength. That is why, as president, my husband will not fear disagreement or dissent. He believes that our voices � yours and mine � must be the voices of freedom. And if we do not speak, neither does she. In America, the true patriots are those who dare speak truth to power. The truth we must speak now is that America has responsibilities that it is time for us to accept again. With John Kerry as president, global climate change and other threats to the health of our planet will begin to be reversed. With John Kerry as president, the alliances that bind the community of nations and that truly make our country and the world a safer place, will be strengthened once more. The Americans John and I have met in the course of this campaign all want America to provide hopeful leadership again. They want America to return to its moral bearings. It is not a moralistic America they seek, but a moral nation that understands and willingly shoulders its obligations; a moral nation that rejects thoughtless and greedy choices in favor of thoughtful and generous actions; a moral nation that leads through the power of its ideas and the power of its example. We can and we should join together to make the most of this great gift we have been given, this gift of freedom, this gift of America. In his first inaugural, speaking to a nation on the eve of war, Abraham Lincoln said, "We must not be enemies. Though passion may have strained, it must not break our bonds of affection. The mystic chords of memory, stretching from every battlefield and patriot grave, to every living heart and hearthstone, all over this broad land, will yet swell the chorus of the Union when again touched, as surely they will be, by the better angels of our nature." Today, the better angels of our nature are just waiting to be summoned. We only require a leader who is willing to call on them, a leader willing to draw again on the mystic chords of our national memory and remind us of all that we, as a people, everyday leaders, can do; of all that we as a nation stand for and of all the immense possibility that still lies ahead. It was the first time I have clapped at for a speech in awhile. Obama was good too. But, Teresa spoke about deep issues in understainding other cultures and to us as former volunteers. The speaches at the Democratic Convention reminded me of a time long ago, in 1963, when we were first asked what we could do for our country. For the first in a long time, I felt a sense of true patriotism based on hope, rather than fear and forboding. Teresa exemplifies the change. Intelligent, literate exciting leadership; rather than unintelligent, illerate pandering to bigotry and divisiveness, while plundering and squandering our resources. We should be facing up to our potential role as a respected leader, working with others on this wee-planet; rather than an out of control neo-colonialist, blundering around the globe with a Neanderthalic policy of death and destruction. We now have a leader who will ask "What if...?" -- one that will ask for our best, rather than our worst. It's '63 all over again. It was thrilling to hear a potential first lady greeting the audience in 5 different languages. One of the things that is so frustrating as an RPCV is the limited awareness that so many Americans have of the bigger world beyond our borders. Heinz Kerry brings a refreshing international perspective to this year's election politics.